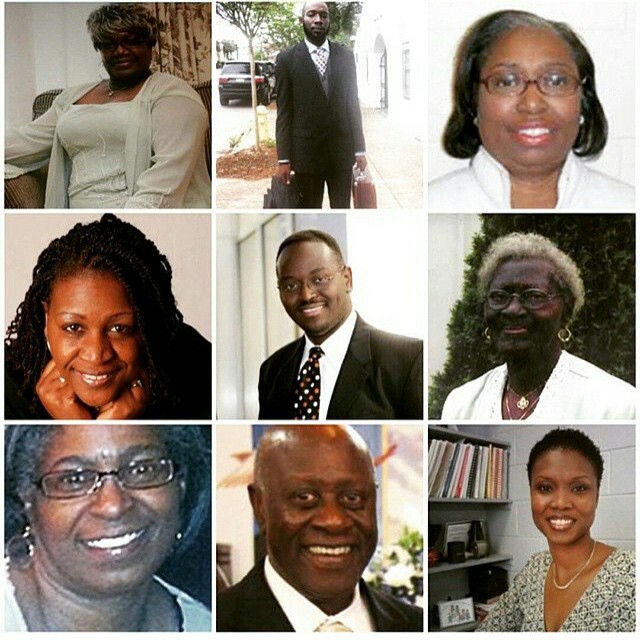 My Facebook newsfeed and my Twitter feed are filled with faces - the faces of the 9 people murdered in Charleston inside the walls of their church, the face of the murderer, faces gathered in circles to pray on street corners. Tragedy has happened. Again. White has acted in hatred and violence against black. I'm not usually one who is at a loss for words. I can usually find a THING to do to take action. But something about this... this guy sitting amongst these people inside the walls of their church and then taking their lives. I pray. But it doesn't feel like enough. I know God was in that place, holding those lives, bringing them home in His arms. But even that feels hollow. And now, the main reaction I see is Blame. Gun supporters vs anti-gun people. We are all so divided, so separated. How do we ever come together to love each other, honor each other, respect each other? My heart is broken. Violence is rippling through a community. Violence ripples through families and communities and cities and states and countries on a daily basis. My heart is broken for the families and friends of the 9 lives taken at Emmanuel. But more than that, when these terrible acts of violence occur, I am reminded of the violence, all of which is based in hatred and evil, that is real and tangible and seems so strong all over the world. And then I feel overwhelmed and scared and angry and sad. So I don't know what to say. I don't know what to do. I pray because it's all that I can do right now. It's all I can rely on. I see God in these beautiful faces. And I pray. In the 10 years that we've been a family-with-kids, we've done 2 really big vacations. One was a trip to Pennsylvania. We went to Sesame Place and visited family in a mountain family home in the northeastern part of the state. That was in 2008. In 2013, we took the Big Plunge and we did Disney World. Aside from those 2 vacations, our travel mostly consists of road trips for long weekends. We have visited Cincinnati, St. Louis, Louisville, southern Indiana (Holiday World), and one of our favorite cities to visit - Fort Wayne, IN. We've also done "staycations" right here in Indianapolis. Generally speaking, when doing a road trip to a city, I prefer to stay in a downtown hotel. If it's a city I am already familiar with, I'm ok staying in the suburbs if it's less expensive - but generally, I like being central to most of the activities we will be doing. When we stayed downtown in St. Louis, we were able to walk to a lot of the items on our agenda. One of my favorite ways to learn about a city is to use TripAdvisor. Type in where you're going and you can find the best rated restaurants, attractions, hotels. It's great to read reviews from people who have been there recently. I use it as a tool to plan our trip - I like to have an idea of what restaurants are nearby the hotel, near the attractions we are visiting. This summer, I've already done a weekend away with Christy and we visited the eastern part of Indiana (Richmond and Cambridge City). Coming up, the family is going to Fort Wayne for a 3 day weekend that will be jam packed with a baseball game, Ribfest, Make Music Day, the Children's Zoo, Science Center, and more. Later in the summer, I'd love to get to southern Indiana and visit some of the local caves and maybe hit Holiday World. I think that there is great bonding that happens in a family when you travel together. It's exciting - even if it is frustrating sometimes - to stay in a new place and navigate a new city. Yes, we all take turns getting cranky. Yes, we wear ourselves out sometimes trying to cram in all the fun things. But that's part of what leads to the fun and the memories. We enjoy doing fun things right here in our own area, of course. And there are things I want to do this summer that we haven't done together before - like visit the Monon Center in Carmel or drive to Prophetstown State Park to visit their water park or spend an afternoon along the Canal downtown or go hiking in a state park. But something is different when you go somewhere new. When you have to rely on each other in a different way. When you can step away from chores and jobs and such. So we will be doing what we can to make this summer fun - we will be visiting different places in our state. There won't be any trips to the ocean or airplane trips to faraway places. But we will spend time together in the car, listening to Harry Potter on audio, fighting traffic jams, using GPS to find new places, experiencing new-to-us restaurants, having fun with just each other. One of the hardest things for me as a parent is seeing my kids be mean to each other, mean to others, mean to themselves. Kindness is a value I take pretty seriously and is something we've tried and tried and tried to teach our children. Kids are kids, I get that. Which means sometimes they are mean or selfish or argumentative. I feel like I'm always encouraging my kids to be kind, to show kindness to others. And it struck me that maybe it's hard to do that if you don't understand exactly what kindness is supposed to look like. I made them a list. We're going to work on it this summer. And I realized that a lot of it might apply to adults the same as to kids. So read it over - tell me what I missed! · Say “yes, sir” or “yes ma’am,” - especially to people who are older. · Show respect in public by behaving. This is being kind to the other people in the restaurant or store. · Think of others around you before you think of yourself. · Invite others to play – especially someone who has no one to play with. · Do what someone else wants to do – not just what you want to do. · Don’t always be right. Other people feel special when they get to be right, when their idea is chosen. · Listen to others. When we take time to listen, we get new ideas, we might be able to help someone with a problem, we make someone else feel important. · Think about how someone else might be feeling. · Pay attention to your inside feelings – if something feels wrong or mean or yucky, how can you make a different choice? · When you see someone is hurting or upset, try to help them feel better. Especially if you caused the hurt but even if you didn’t. A smile, help getting up, telling someone else to stop being mean… those are choices that change lives. · Ask God to help you love people better, love them more. · Thank God for things that happened or things you saw that day. · Let God know what you wish you would have done differently that day. Yes, I am singing that to the tune of a specific Katy Perry song. As I've shared, we left our church home of 11 years. And now we are on a journey to find our next church. We don't have a list of churches we intend to visit. Instead, we find one and then we visit and if we like it well enough, we come back. Should we find something that doesn't work for our family, we move on. We had spent the last few weeks attending a non-denominational church near home. We liked the worship experience, the lead pastor, the children's ministry, the authentic way the church and leaders shared church and personal struggles. So we kept going back. But we've learned that the church has a strong culture (and it's interesting that it comes from the congregation up and not from the pastor down) of women submitting to men. That doesn't work for our family. Part of what I want out of these next few months is the opportunity to have different faith experiences together. This past weekend, the kids and I went to Cincinnati to visit my family (leaving Jeff home to work on projects). On Sunday, we went to Mass in a Catholic Church. Well, we actually went to Mass twice in 2 different Catholic Churches. My brother and my dad are Roman Catholic. Both are very serious about their faith, their relationship with Christ, living a spiritually driven life that is pleasing to God. My mom is Lutheran - which is how I was raised. Growing up, I went to Mass many times with my dad. I wasn't Catholic but I enjoyed going with him and I enjoyed the conversations we would have - about baptism and about Mary and about faith. I left home for college and started seeking my own path. For the past 11 years, I've been a member of a United Methodist Church. But I haven't had an actual Methodist experience because the church did things in a different way. I didn't grow up Methodist and I've actually not attended a traditionally Methodist church before. The foundation of the church we've left was Methodist - don't get me wrong. It's not like the church went renegade or anything. I'm just saying that if you grew up in a United Methodist Church and then went to that church, it wouldn't feel Methodist to you. I am not tied to or defined by a denomination at this point in my life. We teach our kids that we are Christians and that there are a lot of churches and a lot of faiths that are also Christian - we all have the same foundation but we practice it and teach it and live it in different ways. This past Sunday, my kids and I had the opportunity to go to Mass with my brother. He has recently moved back home for a new job. He is working on finding his own place to live and his own church (parish) to become involved with. He invited us to visit a church he was interested in. He felt it might be more contemporary from the little he had seen. Well, he was right. It does seem to be a church that is trying to be more contemporary. This was my first experience of walking into a Catholic Church and walking past a large staff office area, the sanctuary felt the same as any other room in the church, the priest didn't sing any of the liturgy and there wasn't any stained glass. One of the things I love about Catholic churches is the stained glass and the beauty of the Sanctuary. While Mass did follow the readings and calendar of all other Catholic Churches for that Sunday, there wasn't as much of the ritual and tradition I used to experience in Mass. Then we went to the Catholic Church where Ted basically grew up and where my dad is very involved. Sanctuary feels like a holy space. Check. Turns out, this past Sunday was a special Holy Day in the Catholic Church - the Feast of Corpus Christi. At the first church, I had no understanding or sense that this was a really special Sunday. At the second church, I not only knew this was a very special Sunday, I loved feeling the awe and respect and depth of spirit just walking into the Sanctuary. The Knights of Columbus were present. There was a processional they led of the priests and altar boys and the cross and the incense. There was deep respect and solemnity of the handling of the Host - the Body and Blood of Christ. I had to leave prior to the processional that took place - but I wish I could have stayed for it. I don't see myself ever becoming Catholic. There is a lot that I don't agree with or that doesn't make sense to me in my life experiences and my faith experiences. But that doesn't mean I discount Catholicism. I believe that God works through different faiths in order to reach different people. My dad and my brother live their lives very close to Christ because of their Catholic faith. I know people who live their best through their Baptist faith or Lutheran beliefs or whatever. There are megachurches and there are almost micro-churches. My experience in Mass the 2nd time was that God is present everywhere. The Holy Spirit is working through people and buildings and music and faith in many different churches and gatherings. Just as I can be moved while singing a contemporary song of praise, I can also be deeply awed in soaking in the beautiful voices that made me feel like I had taken a tiny step towards angels singing in heaven while sitting in a Catholic Church. Yes, I do believe the Church can be dangerous - power in the wrong hands, used the wrong way. But mostly, I believe that churches and church-goers and people of faith and people seeking are all just trying to find the best ways to love, to be compassionate. It's going to look different in each person and within each set of walls. But it's truly the foundation of Christianity - love. And it can be found in different forms, different traditions, different songs, different people all around us. Our next family church experience will be a United Church of Christ - the church we plan to visit is very women-led and is open & affirming. I've done a lot of digging on their website and like what I see in terms of ministries, listening to sermons, and community outreach. I don't have a lot of memories of summers as a kid. I think weekends and summertime in my elementary days kind of all blended together. I remember being outside from before lunch to dusk. I remember our apartment complex had a pool and Mom would take me when she could. I remember adventures with my parents where we would go to the zoo or to a state park or other fun places. As an adult, I long for summer break. I want those long days where you look back and can't believe all the things you did that day. Or you look back and can't believe all the things you purposefully didn't do! This year, more than most for some reason, my adulthood of not having a summer break is hitting me a little hard. Not because I want a vacation or anything. It's different. I have friends who are stay at home moms or who have summers off or who work part time and they have days at home with their kids. And they are planning trips to the park and days of kids running through sprinklers and recipes for homemade popsicles and afternoon trips to the library and lazy days by the pool. I'm trying to pack all of that into weekends. My kids will have memories of those things this summer. We're blessed to be hiring one of our favorite young people to nanny for us. She's mature and responsible and independent and a wonderful influence on my kids. And since my kids get to be at home for summer break, they get to enjoy all those summertime things. Coming in hot and sweaty from playing tag or basketball or jumping on the trampoline... grabbing towels and popsicles and hitting the hose to squirt down and cool off. Our nanny will take them bowling or to the park or to a movie or to the library. They will do a summer camp at tae kwon do. Without me or dad in them. Yes, we will have fun weekends. Yes, we will go fun places. Yes, we will have down time together. But there is a little part of me... a full time, professional, corporate mom... who wishes I could be home and just jump outside to grab the hose and take a long drink and then spray the kids. Who wishes I could pile everyone into the car and run off to the library. Who wants to just sit on the back deck in the sun while I listen to the kids running up and down the street. We all make our choices and then we have to live them. And I do. Most of the time, I'm very content with how our lives work. It works well for us, for our family. But sometimes... I wish I was the one at home, sleeping in, building forts, making popsicles, going to the park or the zoo or the pool. I wish I was sitting on my deck, listening to my kids play in the yard. I wish that summertime meant lazy days and playtime and freedom instead of summertime meaning... same day, different month. I know other moms feel the same guilt. The same longing. I just keep reminding myself that this is the life we chose. This is what works for our family. The choices we make now impact choices we wil make in the future. Jeff and I have certain priorities for our kids, for our family - and to make those priorities reality, both of us working is necessary. Most things in motherhood or parenthood seem to relate to sacrifice. Summertime is just one more area where I have to sacrifice. And I could choose to focus on what I'm missing or I can focus on what I gain through my sacrifice - on why I live this way. After all, we're all just doing the best we know how to do with what we have right now. So I will do what I can to capture as much summer fun in my evenings and on the weekends. We will travel and play and be together. We will let loose more often and have our own summer fun. My "summer beach pail list" (I can't call it a bucket list, just can't) will have a lot of the typical summertime fun stuff on it... it's just going to happen in our own way, in our own time. I can get upset that I'm the one missing out on the fun - or I can be content that I've done all I can to make sure they will have positive memories. I can be bummed that I'm not the one taking them places - or I can be content knowing that being at work means that I can provide for them to have experiences they wouldn't otherwise have. I can focus on me being left out - or I can be happy that we have someone in our lives that we think so highly of be with my kids, loving them, caring for them, being part of their childhood. My kids will always look back and remember having fun as a family. It's just something we do. We play and laugh and dance and get silly. My kids will remember dance parties spilling from the car to the driveway (we do a fantastic family dance in tae kwon do uniforms to "Shake it Off"). My kids will remember mom running barefoot down the street after the shaved ice truck. My kids will remember doing yard work with dad. My kids will remember shooting hoops with daddy or the mini-baseball-diamond-in-the-driveway games. My kids will remember bike rides and evening walks and watching fireworks and squirt gun battles and movie nights. And all of that is what happens evenings and weekends and days off. Summer fun is still fun. It's just that in my family, it has a slightly different look. And in the long run, I'm really ok with that.